Update Your Curb Appeal With a Succulent Stump Planter | Bringing together stories, rooms, life. Two years or so ago, my co-worker gave me a tree stump from his yard. I put it in my front yard and it has been decaying there ever since. In fact, my friends use it as a marker to find my house. “It’s the house with the stump in the front,” they say. Barren stump doesn’t have much curb appeal. The decaying stump makes an ideal planter. And since it gets full sun, a succulent planter is a good choice. Luckily, I have several overgrown succulents just waiting to be repotted. Look for different varieties to make an interesting display. 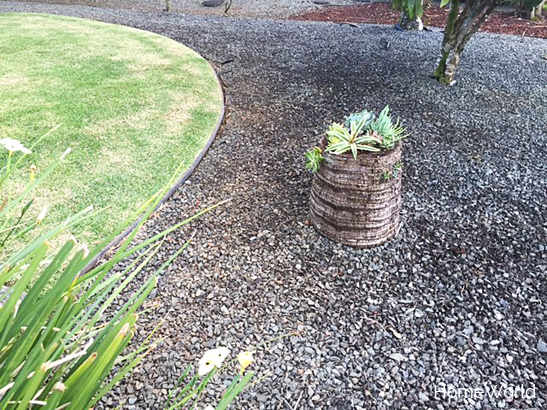 To fill the giant hole in the stump, choose a nutrient-rich soil or compost. Fill the cavity to the top. Arrange your plants before planting them in the planter. Move the plants around and look at it from all angles until you find an arrangement that works. Taa daa! It’s that easy. Water thoroughly. I even planted smaller succulents on the side of the stump. I hope they grow! Since the stump gets full sun most of the day, the succulents will need water once a week. Now I’m the house with the succulent stump in the front! Do you have a stump in your yard that needs sprucing up? This entry was posted on January 29, 2016 by Terri Dux in Advice, DIY, Gardening, Outdoor Space and tagged compost, curb appeal, gardening, natural, outdoors, planter, stump planter, succulents, tree stump.